You don’t have to wear earbuds to enjoy the music stored on your phone, or buy a speaker dock for each room you might want to fill with tasty tunes. The Jambox from Aliph (well known as a high-quality earbud manufacturer) is a portable Bluetooth speaker that basically turns your phone into a very capable boombox, and adds speakerphone capability too. The sound-to-size ratio is impressive. The Jambox measures roughly 6” x 2” x 1.5”, making it perfectly portable. It does have some heft, at 12 ounces, and that’s a good thing. Inside the stylishly designed enclosure are two speakers and a cleverly designed passive bass radiator that produces truly surprising low-end power from such a compact package. There’s also a hefty rechargeable lithium ion battery that runs a good 8 to 10 hours of continuous use, and will last for days on standby. Pairing via Bluetooth is simple (in addition to cell phones, the Jambox is a nice companion to Bluetooth-enabled laptops and tablets). For devices without Bluetooth, there’s a standard 3.5mm stereo jack. There’s also a built-in microphone for making speakerphone calls. Aliph developed exceptional nolse-cancellation technology for its Jawbone Bluetooth earbuds, and that’s included here, along with the company’s product programmability options. Connect the Jambox to your computer, head over to the website, and you can actually download apps into the device, changing the voice used to give system feedback, setting one-button access to a frequently dialed number, having your email read aloud, and using your voice to send texts and emails. My enthusiasm for Jambox doesn’t lie in its unique programmability, though, ingenious as that might be. Like many of you, my phone has become a life hub for me, with lots of music (including an all-you-can-eat music subscription service), audiobooks and video stored on it. Of course, all my contacts are there, and I can call them without long distance charges. Now I can put the phone in my pocket and the Jambox in the palm of my hand and have MP3 accompaniment while working in the basement, listen to Internet radio while cooking and call my daughter hands-free from the table in the den. The audio quality won’t let me sell my surround-sound system on eBay any time soon, but it’s more than adequate for portable listening, and entirely free of that annoying background hiss that drives me up a wall when listening to cheap audio gear. 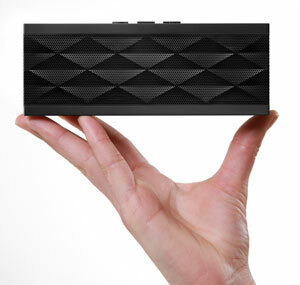 And as a nice bonus, the design and solid construction make Jambox a satisfying object to own. It comes in four colors (black, red, blue and silver), each with high-touch rubberized surfaces top and bottom and a good-looking dimpled metal grille all around. More than one friend has noticed the Jambox on my desk and produced the kind of “ooohs” and “aaahs” a gadgeteer yearns to hear. Whether that justifies the admittedly high $199 price tag is a judgment call, but Jambox delivers practical portability and pleasing audio power as promised. At easi phone we specialise in big button phones for the elderly, we provide big button mobile phones and big button telephones suitable for senior citizens, partially sighted and disabled. Our range includes mobile phones with big buttons and large button telephones; we also provide value added services that come with your big button phones such as pre loaded speed dial to family and friends, daily text reminders for medication and an emergency button that can send out alerts to family members.